While the celiac community has embraced Uno Chicago Grill's introduction of gluten-free pizza to its menu, similar options at mom-and-pop pizza parlors in the Delaware Valley are limited. A Connecticut company, Still Riding Pizza, offers an option for local pizzeria owners. It has developed a partially-baked gluten-free crust for use by restaurants, whose employees are trained to prepare and bake the pizzas using trays and cutters separate from other menu items. To date, the only restaurant in the Philadelphia area offering Still Riding Pizza is Main Line Pizza in Wayne, Pennsylvania. If you are interested in having your local pizza shop carry Still Riding Pizza, you can provide the restaurant's contact information to the company and it will follow up with the owner. 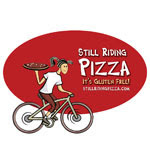 I've eaten Still Riding Pizza at Main Line Pizza and at Carlo's Gourmet Pizza in Marlboro, New Jersey and think it tastes great, more comparable to wheat pizza than any other gluten-free pizza I've tried. In addition to servicing restaurants, Still Riding also sells its crusts directly to the public through its website. I just tried the UNO's pizza at the Plymoth Meeting Location and it was horible. I do applaud them for trying and having a gluten free menu and beer. I 100% agree. Just tried the pizza at the same location and was very disappointed. It was cold and disgusting. ALERT: I just called Sam's. They are OUT of gluten free pizza and they're too busy to separate them so won't have them unitl "AFTER THE SUMMER." Also said We don't carry them anymore" Ah, dreams dashed.